The Digihelic® allows the selection of pressure, velocity or volumetric flow operation in several commonly used engineering units. 2 SPDT control relays with adjustable dead bands are provided along with a scalable 4-20 mA process output. The Series DH provides extreme flexibility in power usage by allowing 120/220 VAC and also 24 VDC power which is often used in control panels. Programming is easy using the menu key to access 5 simplified menus which provide access to: security level; selection of pressure, velocity or flow operation; selection of engineering units; K-factor for use with flow sensors; rectangular or circular duct for inputting area in flow applications; set point control or set point and alarm operation; alarm operation as a high, low or high/low alarm; automatic or manual alarm reset; alarm delay; view peak and valley process readings; digital dampening for smoothing erratic process applications; scaling the 4-20 mA process output to fit your application's range; Modbus® communications; and field calibration. With all this packed into one product it is easy to see why the Digihelic® is the only instrument you will need for all your pressure applications. Service: Air and non-combustible, non-conducting compatible gases. Housing Material: ABS plastic, UL approved 94-V-0. Accuracy: ±0.5% at 77°F (25°C) including hysteresis and repeatability. Pressure Limits: 3 X range. Temperature Limits: 32 to 140°F. (0 to 25°C). Compensated Temperature Limits: 32 to 140°F. (0 to 25°C). Power Requirements: High Voltage Power = 100 to 240 VAC, 50 to 400 Hz or 132 to 24 VDC. Low Voltage Power = 24 VDC ±20%. Display: 4 digit LCD 0.4" height. LED indicators for set point and alarm status. Process Connections: Compression fitting for use with 3/16" OD x 1/8" ID tubing. Enclosure Rating: Face designed to meet NEMA 4X (IP66). Panel Cutout: 1.772 x 3.620" (45 x 92 mm). Weight: 14.4 oz (408 g). The Mother Node™ converter is an easy solution for utilizing the Digihelic's® RS-485 serial communication and connection to virtually any PC. 351-9N - Silver RS-232 to RS-485 Converter with DB9F Connector. Compact 1/8 DIN housing reduces panel space. Set Point status LED indicators display set point activation. Allows user to view process status from a distance. "Hot Key" saves time by allowing instant access to set point and alarms. Set points/alarms can be easily adjusted with arrow keys. Menu Key scrolls through menus to adjust settings. 5 simple menus allow for quick set-up and reduced installation time. Adjustable Clip for panel mounting. Set Point 2 or alarm output (SPDT). 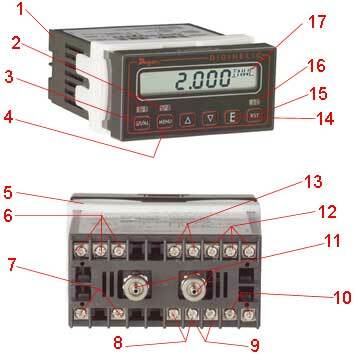 Selectable direct acting control relay with adjustable deadband or high, low or high/low alarm. 4-20 mA process output. View process remotely or send signal to PLC. Alleviates purchase of separate transmitter. 24 VDC power supply. Universal power supply eliminates options, inventory and ordering mistakes. Remote Reset Switch for alarm. Acknowledge alarm from remote location. For users that need quick alarm reset from a distance. RS-485 serial communications. View, record, and adjust control settings remotely from a computer with Modbus® protocol. Durable Compression Fittings for 3/16" OD x 1/8" ID plastic tubing. Secures tubing in harsh applications where vibration & temperature fluctuations occur. Set Point 1 output (SPDT). Direct or reverse acting control relay with adjustable deadband. 120-240 VAC power supply. Reduce inventory and eliminate lead times with universal power supply. Enter a menu or store a value. From home display press to view full scale range. Reset Button for clearing an alarm when alarm is set for manual operation. Alarm LED indicator shows alarm activation status. View alarm status from a distance. Selectable engineering units in pressure, velocity or flow, programmed on one unit. Alleviates time consuming conversions and flow charts. Number Pressure Units - Inches w.c. Pressure Units (ft w.c.) Pressure Units - mm w.c. Pressure Units - cm w.c. Pressure Units - psi Pressure Units - in. Hg Pressure Units - mm Hg Pressure Units - mbar Pressure Units - Pa Pressure Units - kPa Pressure Units - hPa Pressure Units - oz in.